I feel old, but that isn't always a bad thing. One of the benefits is that I have a long memory. And whether it is on the national level or the micro level, I know desperation when I see it. Michelle Goldberg uncovers some startling goings on deep in Conservative World, "With 'Dreams From My Real Father,' Have Obama Haters Hit Rock Bottom?" It discusses a new documentary that has reportedly been sent to over a million voters in swing states, and that may eventually be sent to two million more. The DVD, Dreams from My Real Father, is a riff on Barack Obama's memoir Dreams from My Father. But in the tradition of other conservative propaganda like The Real Anita Hill, this film pretends to provide you with the truth that the mainstream outlets won't tell you. In the case of Dreams from My Real Father, this truth includes the fact that Obama's real father was journalist, poet, and political and labor movement activist Frank Marshall Davis. Apparently, because Davis was married to a white woman, he must have seduced all white women. Hence, Davis and Ann Dunham are the true parents of the 44th President of the United States. But there's more. Davis was known to be a avid photographer. Therefore, he took pornographic pictures of Dunham and sold them to girly magazines in the early '60s. I swear I'm not making this stuff up about them making this stuff up. This reminds me of this guy who hung around my college in the early years. He believed that Stephen King was a homicidal maniac who was used as a hit man by the CIA. This is kind of like Chuck Barris' autobiography (!) Confessions of a Dangerous Mind, but a few years earlier. Coincidence? I think not! This is what comes from calling centrists socialists. This is what comes from insisting that black presidents must be foreigners. This is what the conservative movement has reaped for what they have long sown. But there is an upside to all this. It shows just how desperate and devoid of ideas the conservative movement is. For decades, I haven't thought much of conservative thinking. But at least there was thinking going on. Now it is nothing but the dark id of fear and hatred. According to Nate Silver, Romney now has a 16% chance of winning the election. I just realized. 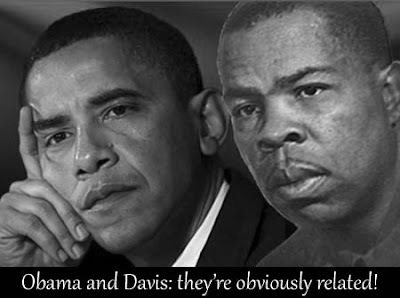 If Frank Marshall Davis is Obama's father, then the President really is an American citizen. Yea!